Alber’s Mill a 1821 Dock Street in Tacoma was constructed in 1904 and was originally occupied by Albers Brothers Milling Company, which made cereal. Between 1945 and 1977 it was primarily occupied by Inter-City Auto Freight and Acme Inter City Freight Lines was in place between 1978 and 1982. Per the Tacoma Public Library, other occupants have included Interstate Terminals, Carnation Milk Co., Puget Sound Feed Mill, Totem Stores, Inc., J.H. Galbraith Co., Acme Fast Freight, Inc., National Car Loading Co., John K. Waite Co., Republic Car Loading & Distributing Co., Consolidated Sales Co., Plywood Tacoma, Inc., E.J. Bartells Co., Plywood, Inc., James Stack Co., Associated Grocers, Universal Carloading & Distributing Co., W.S. Walter Co., Best Foods, Flying Tiger Line, Dougherty Sales Co., Merchant Skippers Assoc., Galbraith Motors, Stor-Dor Forwarding Co., Burnham Van Service, Inc., Burnham World Forwarders, K Lines, Inc., Karevan, Inc., Mountain Road Auto Service, Northwest Consolidators, Inc., Sun Pack Movers, Inc., Astron Forwarding Co., Mountain Trucking Co., and Empire Household Goods. In 2003 in was renovated into loft apartments with William Traver Gallery and Vetri International Glass in the street level space. The retail tenants have since vacated. The property is on the National and Tacoma historic registration. 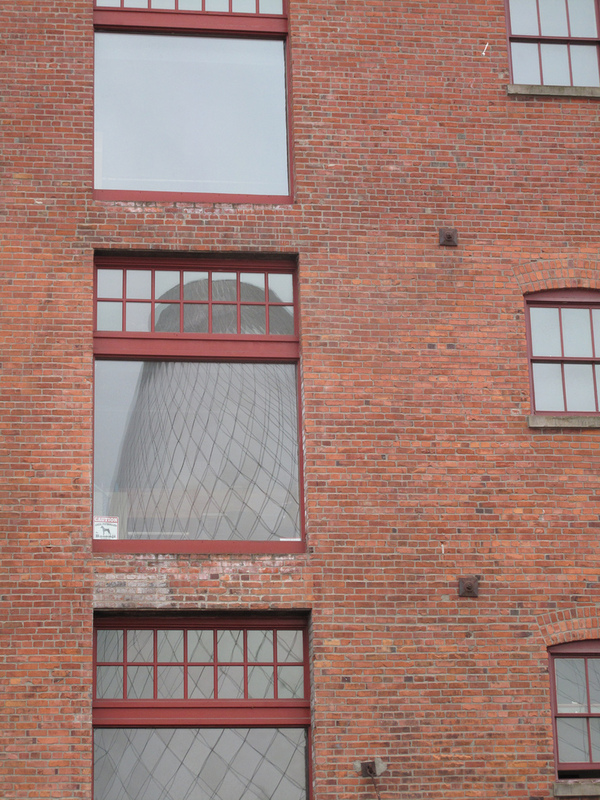 In the photo one can see the reflection of the neighboring Glass Museum. This entry was posted in Historic Sites, Industry, Residential, Tacoma, WA State - Pierce County and tagged Acme Fast Freight, Alber's Mill, Albers, and Empire Household Goods. In 2003 in was renovated into lofts with William Traver Gallery, Associated Grocers, Astron Forwarding Co., Best Foods, Brothers, Burnham Van Service, Burnham World Forwarders, Carnation Milk Co., Consolidated Sales Co., Dougherty Sales Co., E.J. Bartells Co., Flying Tiger Line, Galbraith Motors, Glass Museum, Inc., Inter-City Auto Freight and Acme Inter City Freight Lines was in place between 1978 and 1982. Per the Tacoma Public Library, J.H. Galbraith Co., James Stack Co., John K. Waite Co., K Lines, Karevan, Merchant Skippers Assoc., Mountain Road Auto Service, Mountain Trucking Co., National Car Loading Co., Northwest Consolidators, other occupants have included Interstate Terminals, Plywood, Plywood Tacoma, Puget Sound Feed Mill, Republic Car Loading & Distributing Co., Stor-Dor Forwarding Co., Sun Pack Movers, Totem Stores, Universal Carloading & Distributing Co., Vetri International Glass, W.S. Walter Co. on October 14, 2012 by admin.